Did you know that—whether you live in Montana or not—you can get a special Let Buffalo Roam benefit license plate!? License plates for your car – Montana residents only. License plates for display – for buffalo lovers worldwide. All proceeds from our Montana Let Buffalo Roam license plate benefit Buffalo Field Campaign, the only group working in the field and in the policy arena to protect America's last wild buffalo. Spread the word about the herd as you travel with your beautiful buffalo-benefitting license plate! Where and how do I get them? 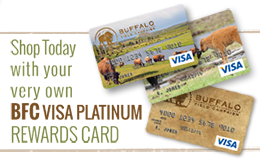 Ask for Buffalo Field Campaign's specialty benefit license plate when you renew or initially register your vehicle in Montana at your local Country Treasurer’s Office (list here). How much do our benefit plates cost? The specialty plates cost an extra $20 per year, which is paid to the County Treasurer/DMV office when you initially register your vehicle and when you renew. You can get show plates to display in your business, home, or anywhere else you choose. These show plates cannot be used to register or license vehicles outside of Montana. To make this happen, someone must actually be here in Montana to order and pay for the plate...or you need to have someone like one of our fabulous BFC coordinators help facilitate your order from our basecamp. We’d be happy to help you! Please just keep reading and then let us know what you want. For $20 you can get a sample Montana Let Buffalo Roam plate printed with AAA-000. For $30 you can have up to 6 characters of your choice printed on your personalized Montana Let Buffalo Roam plate! Please add $2.80 to help cover the expense of the process along with shipping and handling. Total for sample Room to Roam plate: $22.80. Total for pre-printed Room to Roam plate: $27.80. Total for customized Room to Roam plate: $32.80. License Plates c/o BFC, P.O. Box 957, West Yellowstone, MT 59758. Be sure to travel in style wearing your BFC logo t-shirt!